Experiencing a bad hair day affects more than just physical appearance, it also dampens your mood, taking a toll on your self-confidence throughout the day. In Malaysia, the most common hair concerns are stated as (1) dandruff, (2) scalp oiliness, and (3) hair fall. This is why leading global consumer goods company, P&G, parent company of best-selling hair care brands; Pantene, Head & Shoulders, Rejoice and Herbal Essences; will be partnering with Shopee to launch its “Stop Bad Hair Day” themed Super Brand Day. If you have a hair fall scare – you are not alone. Hair fall is said to be one of the main hair concerns in Malaysia. Several reasons are linked back to hair fall such as harsh chemical stress brought about by bleaching and coloring, excessive thermal stress from frequent and prolonged use of hot stylers, and even environmental stress from pollution and UV. In Malaysia’s tropical weather, you need the Pantene Pro-V Total Damage Care Shampoo. It is designed to provide the healthy foundation to your hair by gently removing impurities from the hair and scalp without drying to protect your hair for the day-to-day damage inflicted on your hair. All P&G products can be found via the P&G Official Store on Shopee Mall. Products under Shopee Mall come with 15 days return, free shipping and 100% authenticity guaranteed. 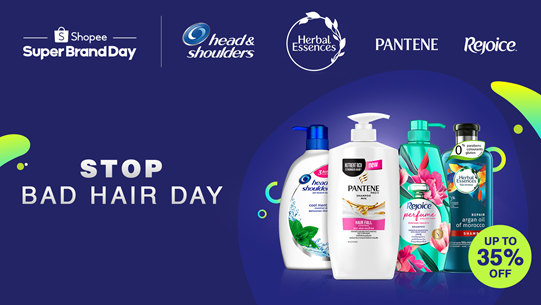 Join P&G and Shopee to Stop Bad Hair Day – shop for all your hair care needs now at https://shopee.com.my/m/super-brand-day!